English import and export trade had for centuries been largely with the western ports of France, northern Spain, Flanders and the Baltic area. Yet until the late-medieval period the most significant long-distance trade routes were around the Mediterranean and eastwards from there, with ports such as Venice and Genoa being the most important. The advances in ship-building in the 15th century made it possible for longer sea journeys and voyages of exploration. In the following century Atlantic ports in Spain, Portugal and England grew in importance, including London, Bristol and Plymouth. Henry VIII’s disagreements with the Catholic Church diminished trade with France, Spain and Italy and English merchants sought new trading routes. Trade with China and the East Indies via the southern coast of Africa was under the control of Dutch and Portuguese ships. In 1548 Sebastian Cabot persuaded members of the Merchant Adventurers Company to raise finance in order to look for a new north east passage to the Far East. London’s merchants and courtiers subscribed six thousand pounds for the venture. In May 1553 Sir Hugh Willoughby and Richard Chancellor sailed from Ratcliffe but their three ships were separated in a storm. That winter the one carrying Willoughby became trapped in Arctic ice and he and his crew perished in the cold. Chancellor and his crew reached the harbour of Nikolo-Korelsky from where he was invited to Moscow by the Tsar, Ivan IV (Ivan the Terrible). Chancellor and the Tsar struck up a trade agreement that took English wool and other goods to Russia in return for Russian furs. In 1555 Chancellor returned to London and the Company of Merchant Adventurers was renamed the Muscovy Company. Queen Elizabeth became one of its shareholders and it was given a monopoly on English trade with Russia. It was the first English long-distance joint-stock company and its influence on the future of London as a trade centre was enormous. International shipping and trading was a lucrative but risky business and merchants needed to share that uncertainty rather than the danger of losing everything. Syndicates began to be formed in order to share the risk and these were formalised as joint-stock companies. As a reward for their investment in the voyages of discovery and in forming new trading posts and colonies each company was given a monopoly on dealings with their particular area of the world. This led to the formation of a number of other English joint-stock companies, including: the Eastern Company (1579) around the eastern Baltic sea; Morocco Company (1585) in northern Africa; the Guinea Company (1588) in western Africa; and the Levant Company (1592) in the eastern Mediterranean. The first voyage by the East India Company was made in 1601. The merchants who formed the joint-stock companies needed convenient places to meet and undertake this complex business together so the first steps were made that were to turn London into a major financial centre. Until the late 16th century one of Europe’s main money markets was in Antwerp and it was there that the London merchant Thomas Gresham acted as Crown Agent to raise finance for the English monarchs. Having first-hand experience of the bourse in Antwerp he decided to open such an institution in London, where merchants could meet to transact business. The first building was opened in the City in 1567 at the junction of Cornhill and Threadneedle Street. In 1571 Queen Elizabeth visited and thereafter it was known as the Royal Exchange. Antwerp’s golden period as the cultural and financial centre of northern Europe ended in 1585 when a large part of the Protestant population fled following a siege by the Catholic Spanish. Some bankers emigrated to London and thus enhanced the City as a major European finance centre. Ships were arriving in London from as far as Barbary (the Atlantic coast of Morocco), Danzig (Gdansk), Venice and Russia. The annual tonnage of shipping entering the port rose fifty percent in the second half of the 16th century. At the beginning of Elizabeth’s reign in 1558 a new set of regulations were introduced, instigated by the Lord Treasurer, the Earl of Winchester. Following a commission on royal revenues customs duties in the port were reorganised, adding three hundred types of merchandise on which duty was payable. In order to manage collecting duties new rules restricted all goods being imported by ship into London, other than beer, coal from Newcastle and corn, to a limited number of wharves on the north bank of the river, mostly between London Bridge and the Tower. These became known as the ‘Legal Quays’. Cargoes from then on could only be loaded and unloaded under the watch of Customs officials at those locations. Those wharves at the ancient Queenhithe – in use since Saxon times – as well as Gravesend, Barking, Blackwall and many other places ceased to be used for imports. 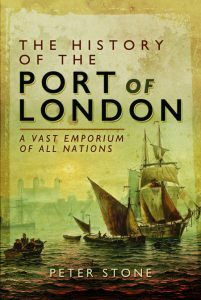 The Legal Quays were to maintain their monopoly on the landing of imports into the Port of London for the following two hundred and fifty years. The main Customs office for the entire port, where the officials based themselves, continued as before at Custom House Quay, upstream of the Tower. Official inspectors from there boarded each ship as it arrived to obtain a certificate of the vessel’s cargo and to calculate the duty. The carrying of goods at London’s market and wharves was monopolised by porterage brotherhoods, known as ‘Ticket Porters’ because they wore a badge of the City of London, of which they were Freemen. During the Middle Ages London was a small port on an island at the periphery of Europe. From the end of the Tudor period that began to change and by the 18th century it had become the country’s leading financial centre, the capital of a growing empire and a major port at the centre of the world. Sources include: Ian Friel ‘Maritime History of Britain And Ireland’; Gustav Milne ‘The Port of Medieval London’; Caroline M.Barron ‘London In The Later Middle Ages’; John Schofield ‘London 1100-1600’; Liza Picard ‘Elizabeth’s London’; John Pudney ‘London’s Docks’; Fiona Rule ‘London’s Docklands’; Arthur Bryant ‘Liquid History’. With thanks to Jean Olwen Maynard for proof-reading.